We are raising food and funds for the North County Food Bank, a Division of the San Diego Food Bank. This is the suggested donation but please GIVE ALL THAT YOU CAN! Eight incredible bands playing for their community. Tattoos, Clothing, Restaurant & Brewery Gift Cards, Surf & Skate Gear and MORE! 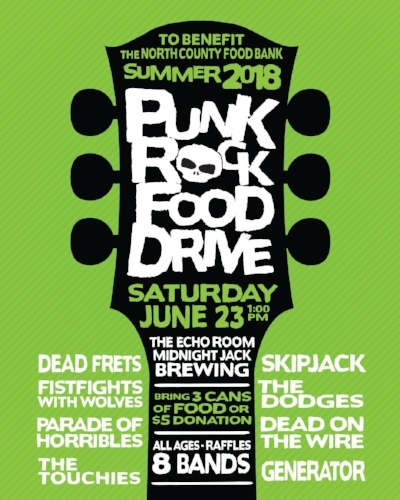 Punk Rock Food Drive has raised over 128,000 meals since our first show in 2009. Come out and show your support for hungry individuals and families in our community. Let's make this our biggest event yet! 10th Annual Thanksgiving PRFD Announced! MULTIPLE TOURGASMS with Badabing and Parade of Horribles!